Following Jack and Jill up the hill…really! Week 46 of my gastric sleeve surgery is here and I am happy to announce my new weight loss total is 95 pounds! I lost two pounds last week to get to my new total. I didn’t lose anything this week; I blame the Easter Bunny. OK, not really. My weight loss has been up and down these past few months, so I am concentrating on the other aspects of my journey and going “up the hill” is a huge part of it. First, let me share with those who don’t know that my children are named Jack and Jill. Yes, my husband and I named our almost 10-year-old and 6-year-old after the fairy tale. Hopefully they’ll still like their names as teenagers or I guess I should start saving for their therapy bills. Anyway…we joke a lot about going “up the hill” because of them. And now I can really join them going up the hill with my new body. Two weekends ago I got the chance to literally go with them. We spent the weekend with friends in Northern California near snow. My fairytale children spent most of their lives in Florida so snow was completely new to them. 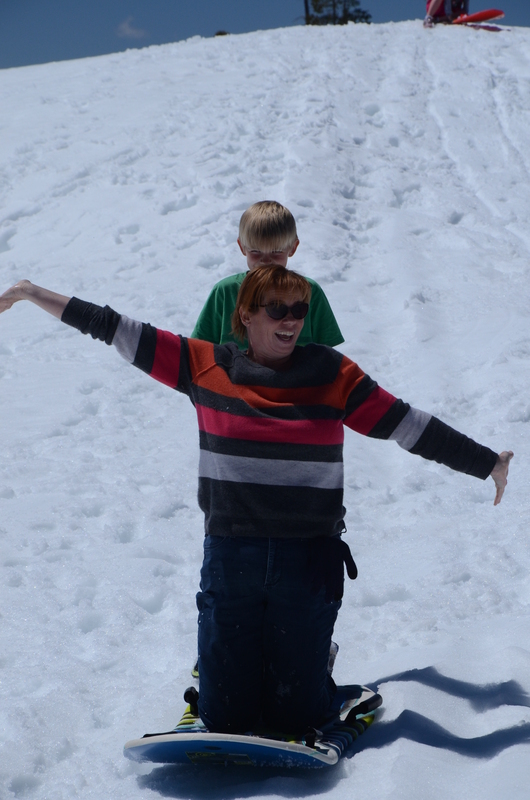 We went to Lake Alpine (7,000 foot elevation) for them to have a quick snow experience. When I was 95 pounds heavier, I would have dreaded this trip. This time I was ready for it! Instead of just standing at the end of the snow making a snowman, I joined them walking and running through the snow. Well, as much running as you can do when you keep sinking in the snow. It was icy and now and then we would drop into the snow. I laughed as my legs would fall through the snow and it would be up to my knees. I know I wouldn’t have done this is the past. The first drop in the snow with my heavier body would have crushed my spirit. Not this time! I pulled myself up out of the snow and kept following my kids. They found a hill and started sledding. The laughter, the cheesy grins and the screams of delight were infectious. I had to join them. I did hesitate though. Thoughts of my old body haunted me and I grabbed the sleds to try to find a weight limit on them. My ever-supportive husband took a sled and headed up the hill first. Watching him laugh and the kids cheering him loudly was just the encouragement I needed. I grabbed a sled and walked right up the hill. I lowered my body on the sled and looked down the hill. 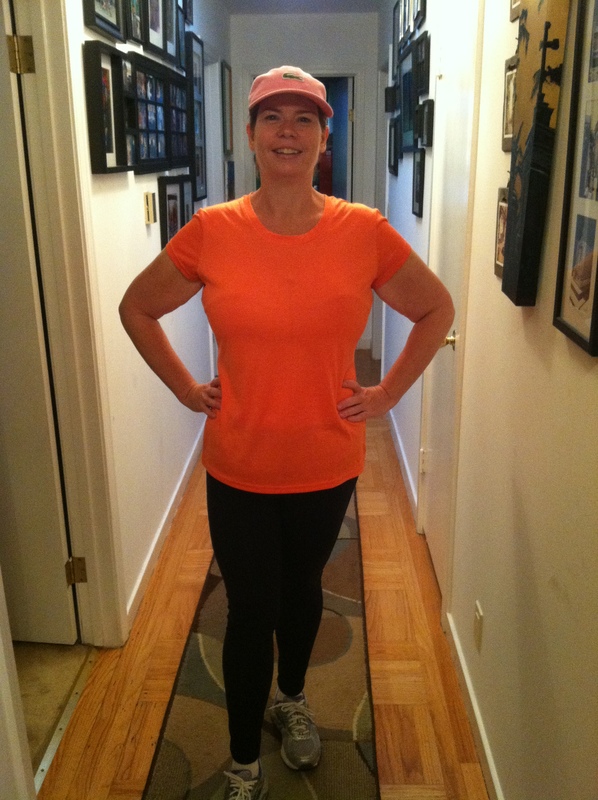 Granted, it wasn’t that big of a hill, but to this formerly obese woman, it was a mountain. “Would I actually be able to slide down?,” I worried. In the words of the incessantly played song “Let it Go”, I did just that. I pushed off and glided down the hill. My “tah-dah!” moment after sledding for the first time with my new body! It was fun. It was quick. It was freedom. I kneeled up on the sled and threw my arms in the air. My son was behind me, waiting for his turn and laughing with me. My ever-supportive husband and my daughter cheered. 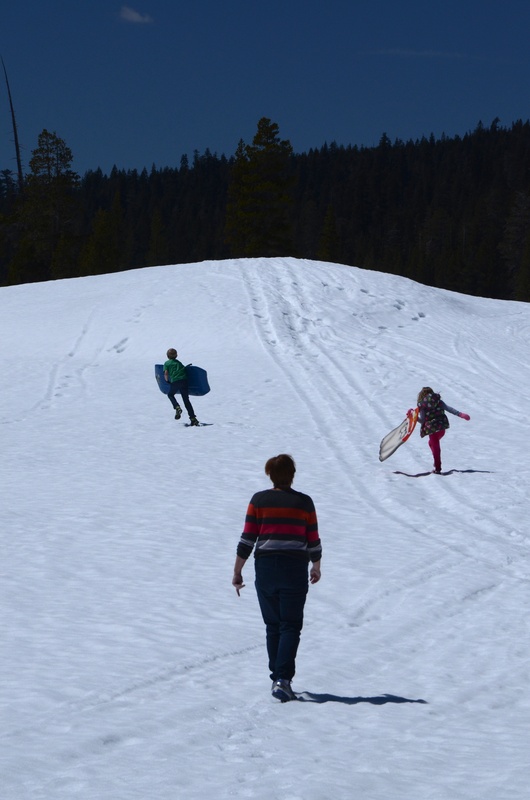 Such a simple act of sledding brought me such confidence, fun and joy. Today’s blog is part of Momastery.com’s Messy, Beautiful Project. 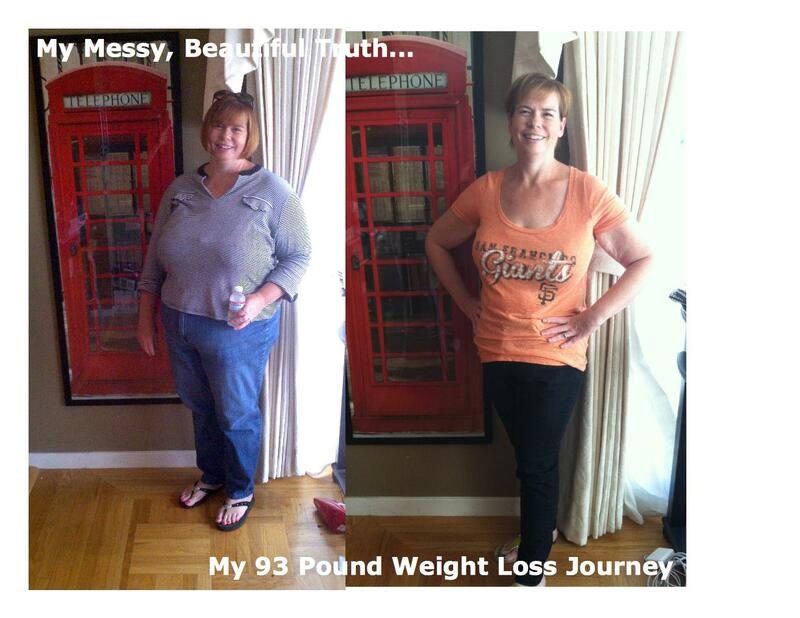 I am proud to share my gastric sleeve weight loss journey here at Down the Scale and now with other Warriors. In the Momastery community, everyone shares their truths – the messier the better. Life is Messy. Life is Beautiful. My weight loss journey is a perfect example of this philosophy. When I decided to take control of my obesity, I though I was searching for complete control and perfection in my life. What I really found is that losing weight and becoming healthy isn’t full of control or perfection. It is messy, painful and chaotic at times. But it is also rewarding, inspiring, loving and perfectly imperfect. While my head knew that losing weight wouldn’t solve all my problems, my heart sure hoped it would. Being obese caused so many problems, but losing weight doesn’t solve them all. Sure, physically I am in the best shape I have been in as an adult. I enjoy exercising now. I can keep up with my kids at the playground. I can shop in the “regular” section at clothing stores. I don’t take high blood pressure medication anymore and I’m not pre-diabetic. Losing 93 pounds from my body is the best thing I have physically done for my body. That’s not a messy part of life, is it? No, it’s pretty beautiful. What is messy are the mental hurdles I just assumed would go away with the extra pounds. Pretty crazy of me to hope for these things, isn’t it? I don’t think I’m alone in dreaming of an easy, perfect solution to my stresses and anxieties. And I know some people felt by having my gastric sleeve surgery I was taking the easy way out on losing weight. My smaller stomach does make physically losing weight much, much easier, but it doesn’t truly affect your brain, your heart and your soul. I can’t stuff my problems down with food now. I have to acknowledge them and deal with them. While my body isn’t working as hard to survive, my brain, heart and soul have to take up the slack. Sounds messy doesn’t it? Yes, it is, but I was surprised to see the beautiful side of my perceived weaknesses and vulnerabilities. When I started blogging with my post “The O Word”, I was terrified to put my feelings on paper for the world to read. Would anyone really understand how it feels to be obese? Would anyone relate to the shame and feelings of failure my obesity caused me? Would I be judged negatively for my solution to my overwhelming issues? Here’s the beautiful part….I am understood. My family and friends rallied around me and showed me more love and support than I could have imagined. Mere acquaintances became huge cheerleaders in person and online. Strangers found me and became new friends. Suddenly, people who I thought were “perfect” shared their own struggles with me publicly and privately. My community grew and strengthened when I shared my story. I finally knew I was not alone. I realize my weight loss journey will never really end. I will always struggle, always be emotional and always worry if I’m doing “enough.” But that is OK. I think these weaknesses are really a sign that I care. I care about life, my family, my friends and most importantly, about me. I realize now that striving for perfection isn’t the solution. I want joy, happiness and love in my life. And by sharing my messy, beautiful life with others, I am finding those things. Who knew a weight loss journey would help find not what I wanted, but I really needed? Which Change is the Right One? Week 43 and down 92.5 pounds! Time to make positive changes like exercising more to reduce stress! Week 43 is here and I am down a half a pound and I am grateful for it. A loss is a loss and it does bring my overall weight loss total to 92.5 pounds, so it can’t be bad. The last few weeks of the scale going up and down is making me think of the changes I need to make to keep motivated. Unfortunately, I am not very practical at times when it comes to changes and the past few weeks have been no exception. Let me honest and share that I am the queen of “let’s make big changes…NOW!”. In many cases, this is actually helpful such as having gastric sleeve surgery. Having your stomach reconstructed to lose weight isn’t a small change, but it was the big change I needed to get healthy. After years of fighting my weight and living as an obese woman, I finally came to the conclusion I needed this drastic change to be the person I wanted and needed to be for myself and my family. This change was necessary for me and I am very happy with my weight loss and my new healthy body. But…I’m bored. I still have much work to do on my body such as losing another 20 pounds, toning up and having my abdominal hernia repaired. I need to get excited about the next part of my weight loss journey, but my head and heart aren’t feeling it. So instead of focusing on the next phase of my journey, this “big changes now!” queen was focusing on other things, most of which aren’t truly productive. We’ve considered moving to the suburbs so I focused on that for a few weeks. While it is practical and positive option for our family, I was using it to run away from my anxiety and stress of my life now. I am overwhelmed with finances, the kids’ activities, lack of social life, little time alone with my husband and my slow weight loss. Instead of working on each issue on its own, I tend to come up with grandiose solutions, like “let’s move and change everything!” While moving might eliminate some stresses, in reality it adds another set of problems and issues. I can see that now, but for a few weeks I focused on making a big change to escape my issues. Don’t get me wrong, big changes can be productive and just what you need, but when I focus on them instead of what really is bothering me, it isn’t productive. I’ve put aside the “suburban solution” for now and think I’m ready to tackle each issue on its own. Yes, I said I think because quite honestly I am terrified to face many of these issues. I’m not sure how to deal with many of my stresses and anxieties since they affect others. Being a parent is the hardest job I have ever had and finding the balance between my needs and my family’s needs is something I struggle with every day. My other stresses, like finances and spending more time doing fun things with my husband and children, have concrete solutions so I know I can find the solutions I need for my anxieties.